congatec AG has introduced a new reference board for video wall system design. 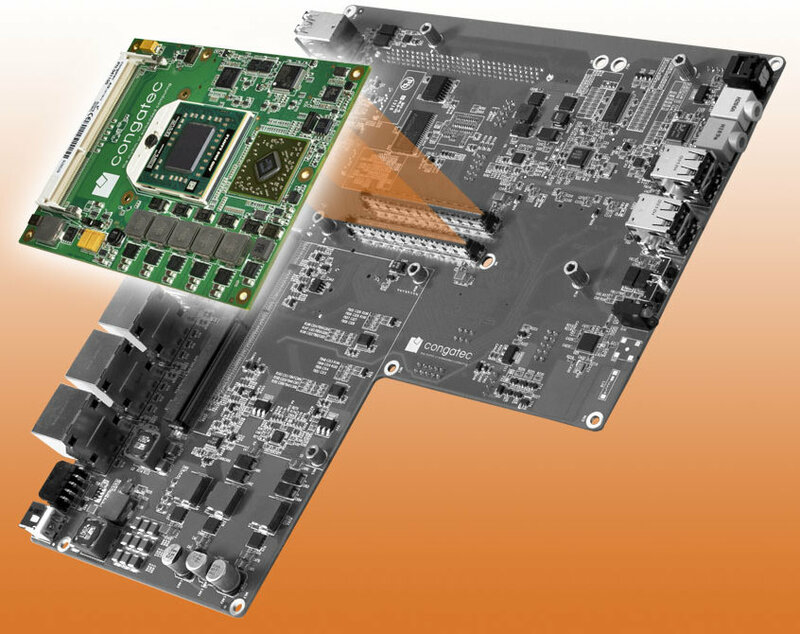 This reference design is based on a baseboard, an AMD Embedded R Series APU COM Express CPU module (conga-TFS) & an optional AMD Radeon E6760 GPU MXM module, and can support up to 9 independent displays. Developers can optionally integrate an additional graphics unit via a complete MXM 3.0 module. Three panels are addressed via the computer module, the remaining six via the MXM graphics unit. The integrated graphics core of the conga-TFS module supports DirectX 11 and OpenGL 4.2 for 2D and 3D image processing. An hardware video decoder handles H.264, VC-1, MPEG4 Part 2 and MPEG2 video streams. There’s no video or dedicated page to this reference design yet, all the information is in the press release, however information about conga-TFS CPU module is available on Congatec website, and AMD Radeon E6760 MXM V3.0 Module on AMD website.